What’s the best part of November? Thanksgiving dinner! We look forward to it all year, and it’s one week away! The food is the main star of this holiday, and there is nothing worse than being excited for stuffing (or dressing…we’ll get into that later) and taking a giant bite of it to find that it’s dry or has too much celery. A bad dish at Thanksgiving ruins the mood for the day, and if you’re the chef, you have to wait an entire year to redeem yourself. We’ve gathered a few tested tips and secrets to teach you how to nail the perfect turkey and how to carve it. 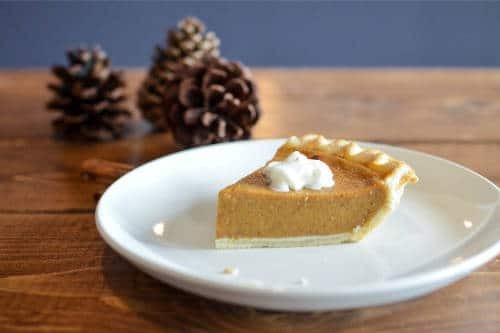 We’ll also talk about helpful tips for the side dishes, and some secret ingredients to make your pies into showstopping and decadent delights. Don’t serve your family and guests a bland, dry turkey this year. Instead, get creative with how you cook the turkey. In recent years, deep fried turkeys have been all the rage, but they’re unhealthy and expensive. 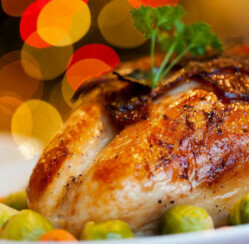 Roasting a turkey in the oven is the cheapest, healthiest way to cook it, but it can dry the turkey out easily. To prevent that, one option is brining the turkey the day before Thanksgiving. This roast turkey recipe from Alton Brown at Food Network will walk you through the steps from brining to oven. So how do you cook the turkey? Start by moving the bird from the freezer to the refrigerator two or three days before Thanksgiving. The morning of, rinse the turkey thoroughly and remove the innards. Now would be the time to brine for a bit, if you desire. If you don’t want all of the excess sodium, or don’t have refrigerator space to brine, we have a secret ingredient that can save your turkey. Apple cider. Yes, cooking the thawed turkey breast side down in apple cider for the first few hours of cooking will allow the turkey breast to absorb the moisture and the delicious flavor of the cider. Then just turn over halfway through and cook as normal. 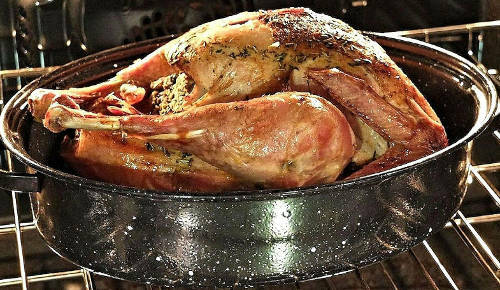 For roasting, the general rule is twenty minutes per pound of the turkey. Crank the heat up to 500 degrees fahrenheit for the first thirty minutes, then reduce the temperature to 350 for the rest of the remaining cook time, until the internal temperature is 165 degrees fahrenheit. Once they main dish has finished in the oven, allow to rest before carving. Now, when it comes to carving a turkey, it seems like you never get those big, thick and juicy slices you see on tv and in the movies. Watch this video to learn how to do just that. What’s the difference between stuffing and dressing? What do you call it? Technically, they’re the same but when it is in a bowl as its own dish, it’s “dressing.” When the mixture is placed inside the turkey, it’s known as “stuffing.” Now that that’s been cleared up, know the main rule when it comes to stuffing/dressing, which is this: always be sure that the mixture is mostly made of the herbed bread cubes. 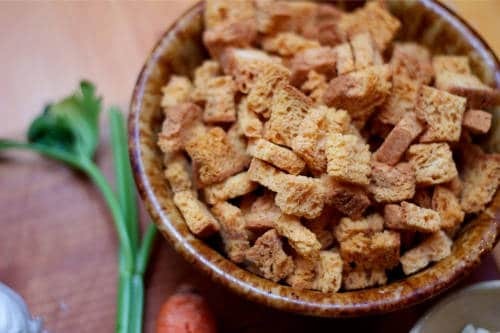 There’s nothing worse than piling stuffing into your mouth, only to taste celery coated in breadcrumbs. Yuck. When it comes to the other sides, try to stick with the traditional Thanksgiving herbs and flavors, but vary the dishes enough that the flavors can be differentiated. For example, yams and carrots can taste very similar with similar flavors. To avoid them tasting the same, prepare the yams sweetly as usual, and stick with brown sugar, black pepper, garlic, and nutmeg as the flavor base for the carrots. And if you’re guests are hungry during the football game before dinner, keep them from stealing spoonfuls of mashed potatoes by setting out this tray of nuts, meats, and cheeses. Calories don’t count on Thanksgiving, right? We sure hope not, because we plan on eating pie no matter what. While there are classic staples when it comes to pie on Thanksgiving, somes the crusts under those delicious concoctions can taste a little plain. If you’re not the biggest fan of graham cracker crusts, make your own cookie crust. Find your favorite graham cracker crust recipe, but instead of using a box of graham crackers, substitute it for a box of store bought shortbread cookies. The result is a sweet, buttery dream. And if you’d like to be on the safe side, have a cookie tray ready in case you sneak a little too much of the pie ahead of time, because we know you’ll want to! Good luck on your Thanksgiving prep! Did we miss something? Are there any other areas of dinner you’re worried about that we can help you with? Share this post and let us know in the comment section below!